Lions Jim Bannan, left, and Frank Cavaliero, proudly stand beside the completed project. New Milford Lions members have reconstructed two sets of wooden bleachers at Volunteer Field to benefit youth sport fans in the community. The project was undertaken to celebrate the legacy of 100 years of service that Lions Clubs International have provided. New Milford Lions have been chartered since 1929. 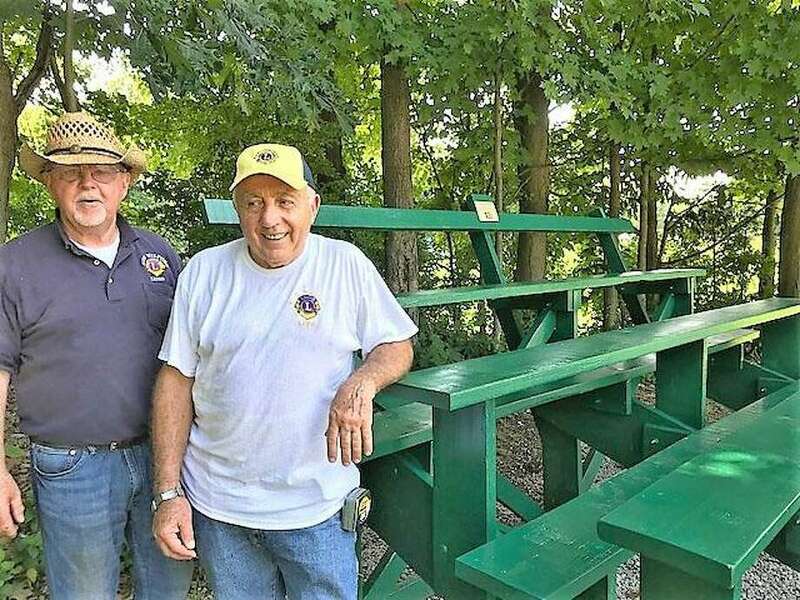 The Lions Club International Centennial Legacy Project required disassembly, replacement carpentry, layers of painting, and reassembly of two sets of bleachers for Volunteer Field, a playing field managed by New Milford Youth Baseball and Softball. Rings End Lumber donated supplies and placed a plaque on each set of bleachers to commemorate the New Milford Lions Club. More than 40 combined volunteer hours of several active Lions helped complete the project.